I finished Homeland today, well, more like last night. I burned through the remaining 150 pages in a night. It's kind of nice to not be reading a monster like the Harry Potter books with 600+ pages or a Pern book in the area of 400 pages but with minuscule text. Despite Homeland's relatively short length I'm reminded that longer isn't necessarily better, a point that was also poignantly demonstrated (a while before I began this project) by Terry Pratchett's Eric, which, despite a mere 148 pages is the best Pratchett book I've read thus far. In Homeland's case the shorter length meant that the story was much richer in content and there wasn't much faffing about. Pausing briefly to think on that point, the focused and concise story-planning strikes me as how a good book should be. If a story element doesn't matter, or doesn't contribute to driving the story in a clear direction, or it muddles the message, then it really isn't worth including in the story is it? That's certainly something I should remember when I try and work on my own projects (although easier said/typed than done). Now that the story is over I'm not really sure what to discuss. Originally, I wanted to discuss Drizzt Do'Urden, the protagonist of Homeland, whom I mentioned briefly last time. However, I now find myself at a loss for words, perhaps thanks to the story's resolution. Whatever I might have had to say before, Drizzt strikes me as just a good all-around character. As far as characters go he is good to a fault, which strikes me as pretty par for the course where fantasy is concerned. Paladin types, those 'good always triumphs' kind of people are a staple of the fantasy genre, although a cliche as well. Unless a character is particularly unbearable we tend to naturally root for the side of good and righteousness and all that good stuff. Drizzt is really just a different take on a classic hero type. Where Drizzt shines as a character, however, is that his struggles are really put into perspective. Whereas many heroes are challenged morally from time to time, often in a manner that you could classify as a test or trial, a relatively short period of time that determine's the hero's mettle, Drizzt is an admirable character because he struggles against overwhelming odds. Drizzt's triumph as a character is that his battle to preserve his morals and principles is not fleeting; he is not a mainstream comic-book hero who is trying to save anyone and everyone, who is forced to choose between greater goods. Drizzt is a good character because his battle is personal. His greatest foe is not another Drow or monster lurking in darkness, Drizzt's battle is one to adhere to his principles and ideals despite overwhelming pressure from his society. As far as heroes go Drizzt is a pretty damn good role-model. Another thing that I like about Drizzt is that his ideals mature a little, which is also something of a rarity for similar character. RA Salvatore allowed Drizzt to recognize the practical limits of his some of his ideals and painted some grey into situations that might have otherwise been black and white. Of course, Drizzt is something of a cliche now that he has had time to permeate into modern culture. I had heard of Drizzt long before I ever picked up any of RA Salvatore's books. 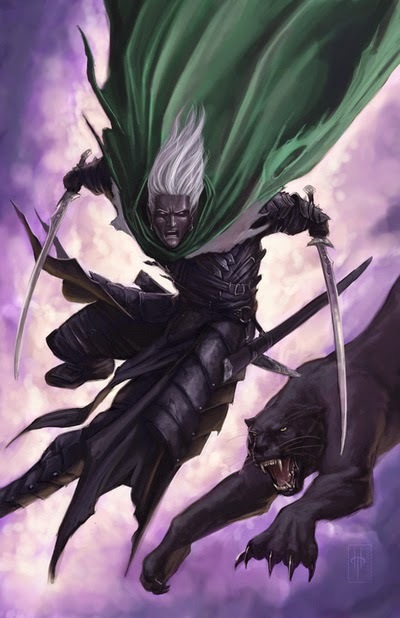 Drizzt's adventures have inspired many more stories and parodies in which characters stand alone against the colossal odds of corruption at the hands of their society/people. Well, that and throw in the fact that Drizzt is a complete badass who wields dual scimitars and it's not hard to see why his popularity skyrocketed (in addition to being well-written of course). I like the much younger interpretation below. Speaking of which, it was nice to read some good fight scene choreography in Homeland. I know in my previous reads that over-the-top wizard battles weren't really the point of Harry Potter but I still can't get over how disappointing many of the battles were. Again, stemming back to one of my earlier arguments, failing to make a fight scene interesting not only diminishes the importance of the event but wastes a lot of potential. There is a lot of creative potential in almost any physical conflict. A well-written fight scene also serves to keep your reader engaged whereas a poorly written or just bland conflict can break immersion. RA Salvatore seemed to find a very nice middle-ground in Homeland. There weren't any battle/action scenes where I found myself thinking that something could have been done better, and at the same time there weren't any scenes where I was thinking 'Holy hell this is amazing'. That's a pretty good place to occupy. I mean as much as I enjoy an amazing fight scene, those can be a little distracting too. For instance, have you ever read something so amazing or shocking in a book that you re-read the the passage, not because you didn't catch it the first time, but because you simply wanted to absorb it better? Well, with Homeland finished I am all set to start the next in the trilogy, Exile, only I accidentally forgot the book at work. I'm not sure at this point whether I can resist the urge to start another book or whether I'll just wait until tomorrow to start. I've never had a problem with reading multiple books, despite the fact that my wife finds the practice inconceivable and bizarre. Reading several books at once doesn't seem any different to me than watching multiple shows. Of course, it has been a while since last I read enough to really attempt reading multiple books. Regardless, I look forward to reading more about Drizzt. Despite not having much to say at first I was still able to cover him in a little more detail so I'm happy about that. Luckily, Drizzt appears in quite a few books, so any opportunities I missed today might still find relevance in future entries.